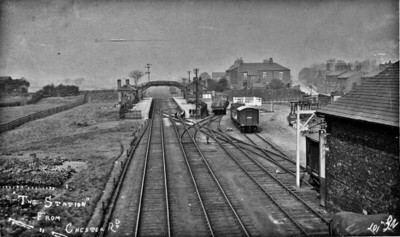 The caption says: The Station from Chester Road. As John says, there are too many Chester Roads for that to be of much help. Could be Chester area, LNW or Birkenhead Joint but could equally be many other places. The distinctive station building is the only clue on this one. Anyone know where it is? I must say it, "looks very Cheshire", being the county I was brought up in. My past record of comments will probably prove me wrong! First thoughts were the Whitchurch to Tattenhall Junc. line; but there were only three stations on it, and none of them seem to line up quite right. But the out of use Distant signal is also interesting. I await more learned counsel! From a trawl through various OS maps (looking for stations close to potential 'Chester Roads') the most likely possibility seems to me to be Upton station (Upton-by-Chester), the first out of Chester towards Birkenhead. There is a bridge carrying the main road into Chester over the railway which would give a view of the station a bit like this, with a street on the right, and open ground (more recently a golf course) on the left. However, it is not clear from the map whether there would have been space for a goods yard between the bridge and the station platforms, or whether the station buildings and so on match up. If I'm correct, the view would be taken looking towards Chester, which isn't that much more than a mile away! I think that the mystery photograph is Chester Road on the Birmingham New Street to Lichfield (City) line situated between Eardington and Wylde Green. The building looks to be the correct wooden boarded type and there was no cross-over points. Consequently, the Goods siding is only accesible from trains travelling in a southerly direction. To overcome this restriction all goods traffic from Birmingham had to go up to Sutton Coldfield and be transferred to a pickup goods travelling south so that it could be backed into the siding at Chester Road. I have quite a collection of coal invoices from this station dated in the 1880s. Definitely not Chester Road Erdington. It looks like the Chester to Whitchurch line but the houses don't look right. Is there a clue in the station architecture? I am going to disagree with both suggetions. Upton-by-Chester halt is ruled out as it did not open until 1939. The station at Chester Road had a much longer platform and was on a curve. So it is back to the drawing board. This is a picture of Hazel Grove station long before electrification and the urban sprawl took over. There are two footbridges in the photograph one is for passengers the other for non travellers on the footpath to Bramhall which would also pass over the Midland Railway 400 yards to the left. The distant signal which is out of use is probably for Woodsmoor crossing the next block along. The Wilkipedia page on Hazel Grove station also shows the large house on Davenport Street still standing. Definitely not Chester Road, Birmingham - that station has a bridge over Chester Road immediately after it. This looks like Calveley between Crewe and Chester. The road on the right wending its way through the village being the main Nantwich to Chester road, the photographer having stood on the road bridge to take this view looking towards Chester. I agree with the Hazel Grove identification. The track plan and signal cabin location corresponds with that shown in British Railways Layout Plans Volume 15 Page 24. I had ruled out Hazel Grove as the road on the right appears too wide and climbs away from the camera, whereas the present road approaches on the level and climbs up to the road bridge, but things change. The boundary fence on the left would suggest sufficient land was acquired for a four track formation, but the station gardener seems to think that a long term project. I too had looked at Calveley, but a browse on Google Earth shows the road elevations to be wrong. Having looked at the 1910 OS Map of the station at Hazel Grove, the platforms, signal box, bridges and surroundings agree with the photo and confirm the location. The pointwork shown on the OS map is different. The trailing connection on the map is by the goods shed rather than direct into the cattle dock, and the cattle dock and adjacent siding are parallel to the running lines rather than at an angle seen in the photo. These differences may help to date the picture. I believe this is Hazel Grove, I have studied a map of the Buxton Branch Railway dated 1882, which indicates that the 2.25 milepost was located on Hazel Grove Station Platform between the Footbridge and Signal Box, adjacent to a House. These three features are prominent in the photograph. For comparison I also viewed a 2009 OS Planning Map (which shows railway mileposts) and the situation is unchanged. An additional source of interest is the Cheshire County Archive Tithe maps. Use Post Code SK7 4EX to find twin maps showing timeline comparisons and revealing landscape changes. Finally, a suggestion. Local libraries usually have access to historical images and I wonder if there is anything here which may be informative. If it is, as most seem to think, Hazel Grove station, was or is the road called Chester Rd. If so, then we can take it that we know where it is. If not, then there would still appear to be room for further discussion. There are several photos of Hazel Grove in The Buxton Line - part 1 - Stockport to Whaley Bridge by Greg Fox (2006), including three from the Chester Road bridge. One of them, taken in the 1963 snow, is from an almost identical position to this one, the main difference being that the siding with the goods wagons and its continuation into the goods shed have gone, together with the loading gauge. Definitely Hazel Grove. A 1976 photo is an almost perfect match. Having being born and bred about 4 minutes walk away from this photo, in the middle thirties, I can confirm that it is definitely the LNWR station at Hazel Grove taken from Chester Road Bridge, which carried the Hazel Grove to Woodford road over the railway. The photo is taken in the direction of Stockport and I suspect it would be sometime in the 1920s, before the Signal Box was rebuilt. The box stood on the platform and was replaced after 1933 with a brick base LMS standard box, not sure of the designation. The land on the left became the Cricket Ground for Norbury Cricket Club just before the Second World War. Between 1943 and 1945, I used to travel between Disley and here everyday to and from Hazel Grove Council School, as we were living with grandparents as Dad was in the Navy. Mum is still alive today at 101 years young. The only mention of Hazel Grove in my extracts from the Passenger Traffic Committee minutes is in Jan 1907 - extend platforms and raise to standard height (min 9217). There will be a minute for moving the down line trailing crossover, but I have not found it. My extracts are incomplete, more so after 1912, and I have not specifically looked in the index volume for "hazel grove". The aforementioned map evidence shows it was moved after 1910. The mystery photo is Hazel Grove. I was a signalman there from 1962 to 1973. The right hand siding into the good shed had been lifted by then, but the rest were still there. Indeed I shunted part of a freight into the siding alongside the goods shed one day (it was too long for the down siding), and by then the cattle dock was out of use, but one Saturday a wagon of cattle was put off a train. The SM, Basil Orford, had to arrange for a local cattle transporter company to come and feed them. There appears to be a cross on the distant underneath the down starting signal. I think this would have been for a level crossing at Bramhall Moor Lane. If you look at this bridge it gives you the impression there would have been a LC there in the early days. Having just checked the view from Google Streetview, I can confirm that this is an old image of Hazel Grove station, taken from the Chester Road bridge. A lot of the residential property is still recognisable.